Knowing how to cook round steak is very important if you want the good taste of steak but are living on a grocery budget. The round section is part of the beef rump and consists of the Swiss steak and the round steak. It is the toughest and least expensive of the steaks. It can be the most flavorful if prepared correctly. Although round steak and Swiss steak come from the same part of the beef, there is a difference in the way I cook them. I have the round steak cut about ¾ inch thick. I pound it out to tenderize, coat with flour, season with salt and pepper and brown in a little fat. Then I add a little water, cover with a lid and simmer on top of stove until tender. The Swiss steak is usually 2 inches thick. I will coat it with flour, season and brown. Then I add a little liquid and place in oven to bake until tender. Mix flour and seasonings together. Rub mixture into both sides of the steak. Brown on both sides in the hot oil. Add the onions and garlic to the top of the steak. Mix the water with the chili sauce and pour over the meat and vegetables. Cover tightly and place in a preheated oven at 325F degrees. Bake for about 2 hours or until the steak is very tender. Lay steak out flat and season with salt and pepper. Spread with mustard then with barbeque sauce. Arrange cheese slices to cover meat; roll up like jelly roll. Secure roll with toothpicks and place in casserole dish. Cover and bake at 325F degrees for 60 to 90 minutes until tender. This is how to cook round steak in a casserole. Season beef with salt and pepper; heat butter and oil in a large pot or Dutch oven. Brown beef in Dutch oven; remove beef and sauté onions until very brown. Add sugar, beef broth and beer to pot stirring until all bits from sides and bottom are blended in. Return beef to pot; add celery, leek, carrot, bay leaf and thyme. Bring mixture to a simmer and cook for 2 hours. Prepare toast and spread with mustard; stir into pot mixture. Remove bay leaf from pot; serve with boiled potatoes or buttered noodles. 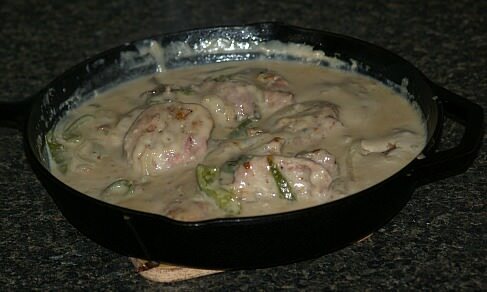 Learn how to cook round steak; a favorite hearty country style recipe. Cut steak in small serving pieces; dredge in seasoned flour and set aside. Melt ¼ cup of the butter in a large skillet. Add onions and mushrooms to the skillet; cook until tender and slightly browned. 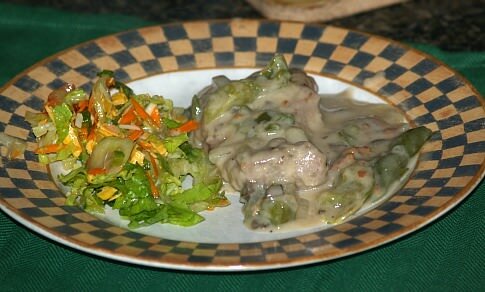 Remove vegetables from skillet; add remaining butter; brown steaks on both sides. Combine and mix water, grated cheese, salt, pepper, paprika and sour cream in small bowl. Add onion and mushrooms back in skillet; pour sour cream mixture over skillet mix. Cover skillet and simmer until steak is very tender; serves 6. Learn how to cook round steak in this kidney pie recipe. Soak kidney in salt water 30 minutes. Drain kidney, remove outer thin layer and slice. Cut each kidney slice in half and trim out fat and tubes; set aside. Heat bacon fat in heavy skillet; add steak and onions and sauté until browned. Stir in flour and seasonings; brown well. Add water stirring constantly over low heat until it boils and thickens. Add kidney slices and cook for 10 minutes. Pour mixture in a buttered 2 quart casserole dish; cover and bake for 2 hours. INCREASE TEMPERATURE TO 425F degrees. Remove casserole dish from the oven; stir in the sherry. Cover casserole dish with rolled pastry dough; make several slits in the top. Return to oven and bake about 20 minutes until browned; serves 6.